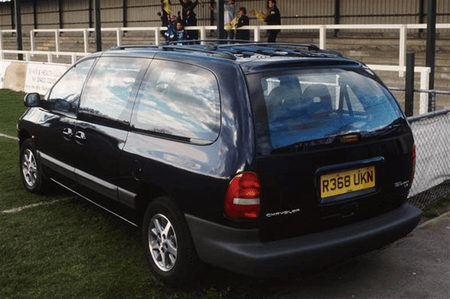 Used Chrysler Voyager Review - 1997-2001 | What Car? What's the used Chrysler Voyager MPV like? Most MPVs have seven seats arranged in a two-three-two formation, but Chrysler took a different approach with the Voyager, laying the seats out two-two-three. Shoulder room is tight in its rearmost row and the removable rear seats are extremely heavy to lift out when you want to swap passenger space for load capacity. However, the larger Grand model does still give you a reasonable boot with all the seats in place. Even on this standard model, there's more than enough leg- and headroom to keep gangly teenagers happy, and the sliding rear doors are big help when getting in and out. The driving position is less impressive. The steering wheel is fixed on SE models, but the tilt mechanism fitted to pricier LE and LX cars makes things little better. True to American tradition, the Voyager doesn't like corners, and the soft, bouncy ride may upset passengers prone to travel sickness. At the same time, it's fidgety over more battered British roads and the steering is vague and overly light.